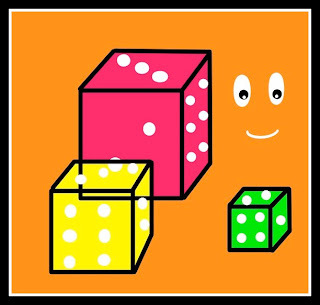 Here is a low-tech game to encourage children's writing that I devised using digital dice. You and your kids could use real dice, or invent your own game with dice as a chance element. Interacting with game pieces like dice adds fun to literacy experiences. Here's how it works: Go to these dice. Choose the number of dice you want - in this case, three. Roll them by clicking "roll dice". 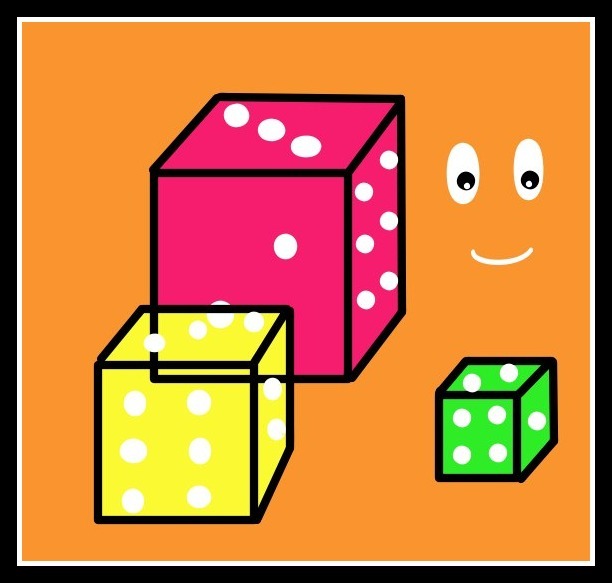 Read the dice numbers from left to right eg 2, 3, 6. Now match those numbers to the prompts below. Find the first number in the first group, the second in my second group and so on. Using 2, 3 and 6 as our result, we see that we need to tell or write a story that has something to do with Baron Von Messyface having no wings in a dungeon. Brainstorm some questions to tease out your story. Who is the Baron? How did he get to the dungeon? If he had wings, would he be able to escape? How can he escape with no wings? Where are the wings right now? What do the wings look like? Can you draw/describe them? Does the Baron have an enemy or any other problems? When you're sick of my ideas, make new lists of your own. Be as creative, as silly, or as challenging as you like. If your story strays from what the dice dictate, don't worry. The idea with this game is just to get you started. If you'd like to try a higher tech writing prompt, check out Story Spinner from Bonnie Neubauer I found recently. It gives you a setting, a starting phrase and four words to use in your story. For more ideas on children's writing, click on the Writing button in my right sidebar. At a recently extended family gathering my Dad gave my kids a set of storycubes - you know the sort of thing - they look like dice but have pictures on them. They were delighted by the idea that they could use them to make up stories and had a great time doing exactly that. @Playing by the book I do know them. Maggie@RedTedArt has a great post on how to make them that I linked to in a storytelling post. This is a kind of variation on that idea and using digital dice makes it easy if your home is chaos the way mine often is! Oh, I do like this! And I'm sure my kids will love it, too. We love trying new writing prompts. @Rebecca Newman LOVE that your kids love to write! Great game. Rory's Story Cubes App (on iPhone) is another but I think it lacks the structure (hero, setting, problem) of your game. On the plus side, it has very satisfying dice rolling sound effects! Great idea! Especially for those reluctant writers who can sit through an entire writers workshop without getting anything down on paper!! @Jackie H.Prompts really can help those kids who are frozen by a blank page I think, Jackie. I know that I feel daunted by blank pages too, and love finding the trigger to an outpouring of words. @Yellow Brick ReadsOh now, that would make my game very cool!